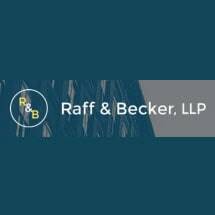 With over 30 years of experience, the partners of Raff & Becker, LLP are dedicated to serving clients' needs. Our partners and associates work closely together in our commitment to provide only the highest quality legal representation to our clients. Keeping your interests in mind, we handle cases in a variety of employment law and labor law related areas, including. We understand that job related problems are stressful. We attempt to minimize the stress by keeping our clients apprised of the status of their case. To that end, our attorneys are responsive to our client's questions and phone calls. Statement of Client Rights. Our attorneys carefully examine the facts of your case, evaluate the nature of the case, and consider optimal venues in which this matter can be resolved. Whether your matter goes to trial, settles, or is resolved through some type of alternative dispute resolution, we provide aggressive and knowledgeable representation. 2009 Pro Bono Leader Award from Legal Services NYC for "valuable probono assistance"